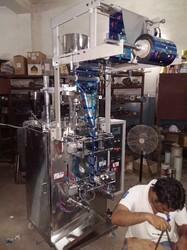 This series VFFS machines is Delta PLC control with stable reliable biaxial high accuracy output. Film-pulling through motorized cam driven horizontal sealing jaws. This machine can make online zipper pouch with top sealing & Euro hole punch. We are manufacturer and exporter of Zipper pouch packing machine that is Suitable to pack powders & granules like Glucose powder, isabgol, tobacco, molasses in three side/ four side seal zipper pouches. 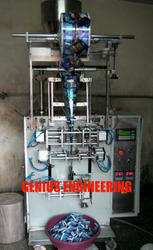 Online Zipper Pouch Packaging Machines is designed in accordance with the international quality standards. We are manufacturer and exporter of Zipper pouch Packing Machine for filter khaini bags that is Suitable to pack 8, 10, 12, 20 filter bags automatically in three side/ four side seal zipper pouches. 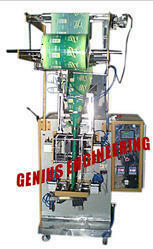 Online Zipper Pouch Packaging Machines is designed in accordance with the international quality standards. 1 ounce to 2 ounce. Four side seal. (One side euro lock and zipper). Any continuous heat sealable laminate in roll form. Yes (to punch hole on top for hanging purpose). Online adjustable disc with cups (SS- 304 make). For easy & proper filling of cups. Through Clutch & Break. (Unitorque make). Programmable logistic control (Messung/ Delta make). three head linear type weigh filler. approx. +0. 5gm to 1. 5gm.